It is true; we aren’t able to get out of our driveway and we have had to cancel some appointments today. It snowed very hard all day yesterday and by the time it was dark I measured it at 40 centimetres (16 inches) of new snow. It continued to snow into the evening and, despite overnight settling, measured 43 cms (17 inches) this morning. 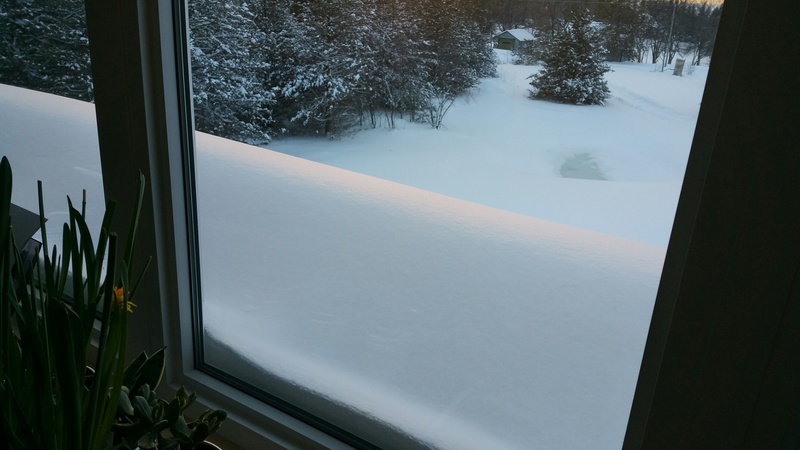 Our neighbours measured 50 cms on the ground and thought that it was the largest snow fall that they have seen in their 13 years living here. 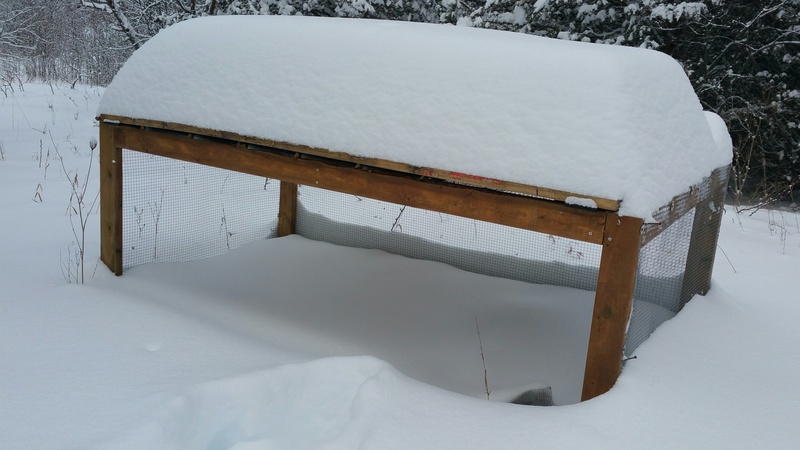 Our snow fall was a little less than Ottawa’s record-breaking 51 centimetre snow fall yesterday but it certainly has impressed us. We have seen this much snow in BC before but there it usually turned to rain and was soon gone. This snow does not look like it is going anywhere fast. 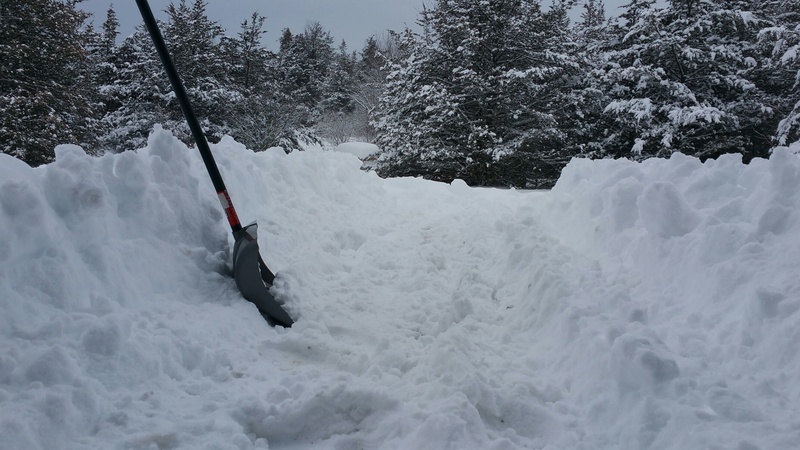 Coming on top of 12 cms of snow before the weekend, is simply too deep for our little walk-behind tractor to plow the driveway adequately. I worked at it several hours yesterday and went at it again this morning. With the tractor now equipped with chains and wheel weights, I have managed to break a path almost wide enough for the car but the snow is still up to 6, even 8, inches deep in the cleared area and the dozer blade is unable to get that over the snowbank on the sides nor is it able to push the snow banks back any further. In retrospect, I should have plowed the 12 cms already on the driveway in preparation for yesterday’s snowfall and then started on the new snow earlier yesterday. I might have been able to keep ahead of it. Next time I will know better! If it doesn’t settle and or melt some by the weekend, we may need to hire one of the guys around here who have a truck with blade and who plow driveways. In the meantime, we are warm and comfortable and don’t need anything. Being snowed in gives us more time to work on painting the window and door trims, a slow job because of the filling and priming needed in preparation. We are hoping to convert this, the summer home of ducks Helen and Forrest, into our first chicken coop. It was moved on Monday, after the previous snow, so was a good place to measure the new snow depth (but I had to wade through knee deep snow to get there each time). The view from the upstairs window is partially obscured by the snow piled up on the roof of the front porch. 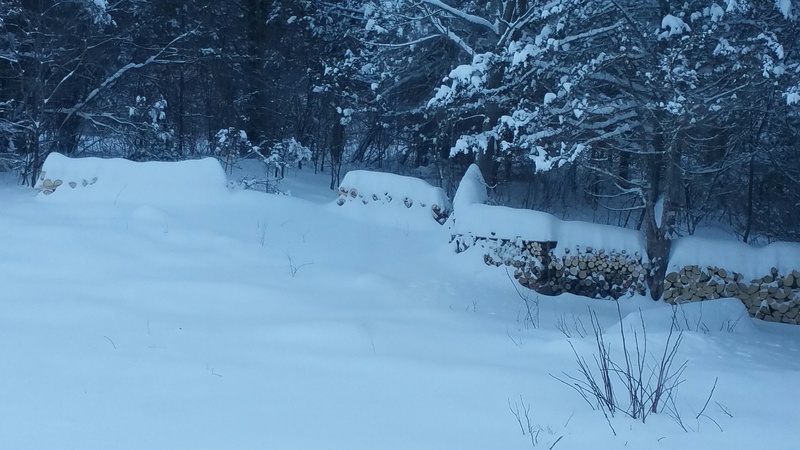 Some of the wood piles in the back yard are beginning to disappear under the snow. The driveway. The snow banks on either side are too large for the tractor to push back any further. If the driveway wasn’t so long I might try shoveling it but, at 300 feet, I don’t think that is very practical. Yikes..we were thinking of you last eve while watching the national. Love the bright yellow mini daff at your window..a bit of spring!